Welcome to the newest edition of What to Wear This Month! This month you’re getting 15 February outfit ideas that highlight athleisure wear, layering for up and down temps and a few outfits featuring spring trends. Enjoy! 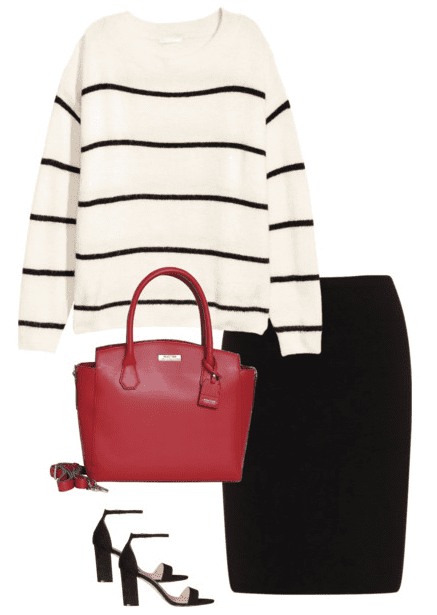 Have you signed up to have access to the Outfit Ideas Library yet? No? What?! 🙂 Head over to this page to read about it and sign up. I’m going to be honest here…I had a really hard time creating February’s outfits! I think it’s a mixture of being so done with the cold temperatures and trying not to replicate the same outfits over and over. Depending on where you live, both February and March can be tricky months to dress for. I’m currently in my hometown in Texas to spend some time with family and friends (plus this is where my 13-year-old requested to spend his 14th birthday) before we head to Florida, and the weather has been tricky. First, it was super cold, so I was wearing sweaters and boots and beanies. Then it warmed up and I was in jeans and long sleeve tees. And now I hear that February could bring an arctic cold front. What?! So the sweaters and boots can’t be put away just yet. You may notice that there are no Valentine’s outfit ideas. Why? Well, since I only make 15 outfit ideas, I honestly didn’t feel like it served you very well to include outfits for one day of the whole month. But if you are interested in these types of outfits, check out these cute Valentine’s Day Outfits from two seasons ago. I also pinned a few ideas on my Holiday Style Pinterest board. You will see one athleisure outfit that features a heart shirt, but it can be worn anytime, anywhere. When I asked on the Mom Fabulous Facebook page what kinds of outfits you would like to see for February, two ladies responded (lol, thank you friends) with athleisure wear and layering outfits. So here we go! I stayed away from the athleisure trend for as long as possible. I was kind of a snob about it really. (You’re going to wear leggings outside of the home?! Oh em gee.) But now that my family and I are traveling full-time, I wear that trend like crazy. And I get what the hubbub is all about. It’s comfortable! It’s stylish! I love it. 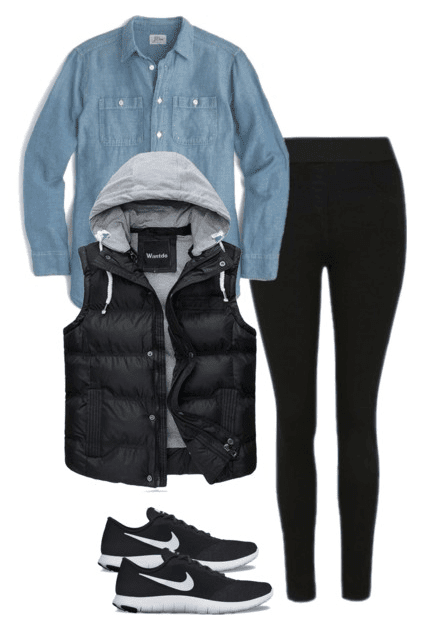 Check out these three athleisure outfit ideas and tell me what you think about the trend. If you’re tired of black, gray is a neutral color you might want to consider. I love mixing gray and white during the winter months, as well as gray and a soft pink. 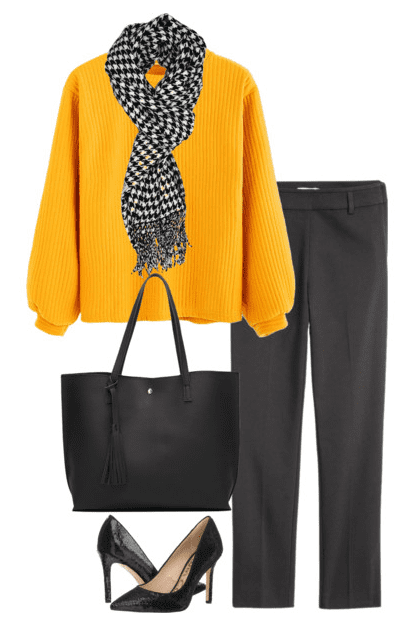 Here are a few outfit ideas featuring a gray cardigan, gray pants, and gray boots. According to WhoWhatWear, high-waisted jeans are a trend we’ll see in abundance this spring. They sit high on, or above, your hips. 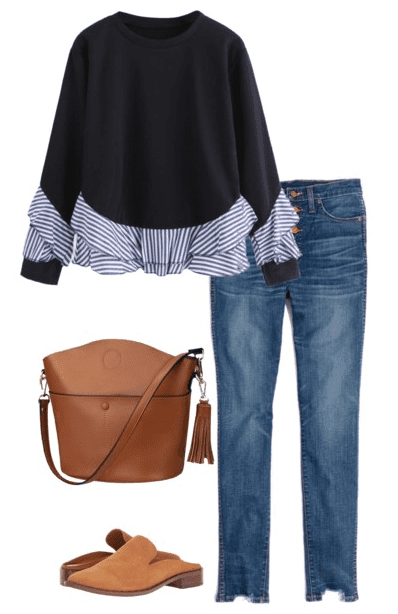 I paired them with a couple of tops that are said to be a little on the short side according to reviewers, but you can wear this style with everything from crop tops (if that’s your thing), blazers, tucked-in tees, button up shirts, etc. Another trend we’ll see this spring, are florals, polka dots, and stripes. There’s no surprise there, but we’ll also see a lot of mixing of these patterns. According to PopSugar, as well as several other well-known fashion sites, mustard yellow is a big color for spring 2018. Think shirts, shoes, trench coats, and dresses. How do you feel about this color? It can be tricky! Now, anyone can wear yellow, as long as you make sure you’re wearing the right yellow for your skin tone. Here’s a good guide to follow. Another color you’ll see everywhere this year is lavender, as well as all shades of purple. Pantone announced Ultra Violet as the 2018 Color of the Year, which affects both the home decor and fashion industries as far as color trends go. If you tend towards neutrals like myself but want to experiment with this color, start with a light lavender and see what you think. I ordered a lavender shirt online, but when it arrived it looked more like pink to me. Regardless, it’s a cute top and you’ll see it here in a fashion post soon. My blogging friend Jo-Lynne Shane featured a winter outfit with a lavender sweater, white jeans, and a grey coat. I love this look on her, so I created a similar outfit. To see all past What to Wear This Month outfit ideas, head on over to the What to Wear This Month page. So cute! I love the heart sweatshirt and the outfit right below that one! You had me at the athleisure haha I was totally against it for the longest time as well, but as a new mom who spends her entire day crawling around the floor with an 8 month old, athleisure is my favorite! haha it’s incredibly comfortable, but looks super cute as well. So it’s the best of both worlds. The perfect crawling on the floor outfits! I guess I wore the same thing when my kids were babies. We just didn’t call it athleisure back then. Ha! I’m loving all these outfit ideas!! The grey outfits might be my favorite with the mix of blush accents but I also love that high waist look with that super cute pearl embellished top! I have a similar cardigan and I do live in it. 🙂 Thanks for stopping by Daniela! Thanks for featuring the athleisure wear! ? It took me awhile to get on board. But as long as my top or a cardigan is covering my rear, I’m loving it!